The Long Beach School District’s Science Program is aligned to the NYS Math, Science, and Technology Learning Standards and the NYS Core Curricula. Science education in the secondary schools begins with an overview of physical science and engineering in 6th grade, followed by life sciences and then earth sciences in the final year of middle school. As students journey through the sciences, they make connections among the disciplines and engage in an independent research project every year, culminating in the annual Science Symposium. Accelerated eighth grade students take Regents Earth Science and sit for the regents in June. The high school offers a variety of courses in the life and physical sciences to provide students with a complete experience in science. 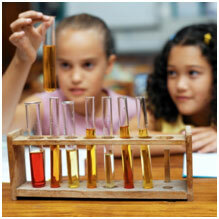 All of our students are encouraged to take the International Baccalaureate and Advanced Placement courses in science. Highly motivated high school students are also encouraged to enroll in our rigorous research program, which offers students an opportunity to perform authentic scientific research as a part of their high school experience. Our research students compete throughout the United States and have enjoyed great success in the competitions. The science department of the Long Beach Public Schools is dedicated to helping our students understand the natural world through a process of scientific inquiry. When students learn using inquiry-based science they are using the same ideas and methods that scientists do when they are conducting scientific research. Through this process our students will meet the rigorous new state standards and learn the essential skills of problem solving. The New York State Board of Regents adopted the next generation of the New York State P-12 Science Learning Standards (http://www.p12.nysed.gov/ciai/mst/sci/nyssls.html) in December 2016, and the standards are effective July 2017. Implementation of the standards will occur over a several year period, with this school year concerned with professional development of educators.